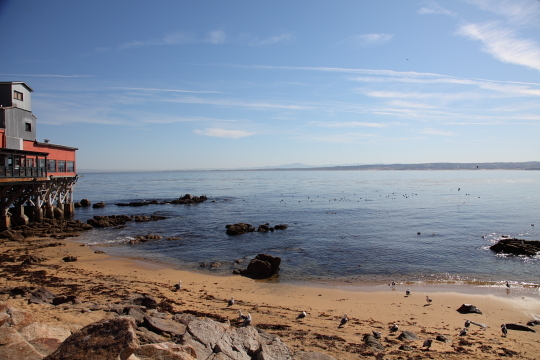 On the last day of our vacation earlier this week we headed down to Cannery Row in Monterey Bay. 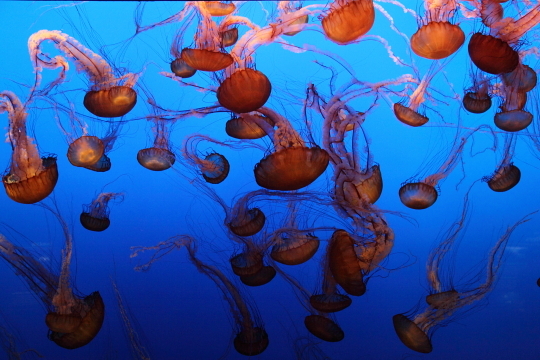 Cannery Row is a very interesting place full of shops, restaurants and of course the Monterey Bay Aquarium. We got to the aquarium when it first opened and since it was a Monday we figured it wouldn’t be so busy. Well it happened to be “locals get in free” day so the place was actually packed. We have visited this aquarium before back in 2006 for our one year anniversary but back then we only had a little Canon point-and-shoot so we didn’t get any fantastic photos. This time I took the Mark II while Bryan used the XTi. I was debating which lens I would use for this occasion. I couldn’t really decide if I wanted the 24-105 F4L which would give me macro and zoom capabilities but would not allow me to really open up the aperture or the 50mm F1.8 which didn’t allow me to zoom or do macro but allowed for a more open aperture. Ultimately I chose to use both, I just put one lens on my camera and the other on Bryan’s and constantly switched off. I used the 24-105 F4L for mostly wide angle shots such as stuff we took outdoors or huge tanks. When the light was really low I just bumped up the ISO, I shot a lot at ISO 4000-5000 but there were moments when I as shooting up to 25,000 ISO. I tried to use the 50mm 1.8 the most in really low light situations however, there were times where it was too dark for the camera to figure out what I was trying to focus on so it wouldn’t take the photo. In that case I just switched my camera to video mode and took a movie. I love the Mark II. 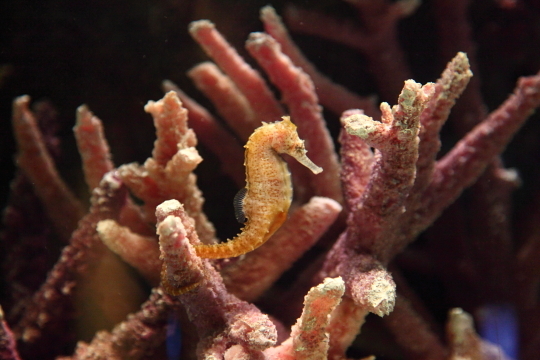 While we were at the aquarium we got to see the new exhibit titled “The Secret Lives of Seahorses”. This was by far my favorite part of the aquarium since I love sea horses. 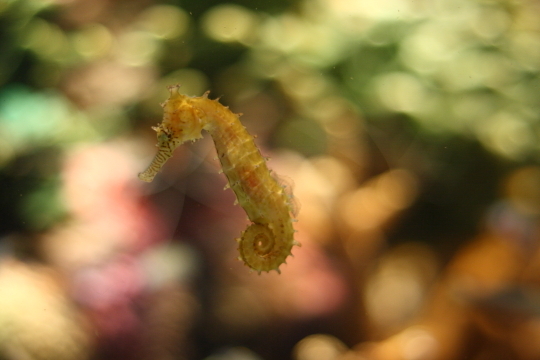 They are just so cute with their little fishy horse faces and curly tails. 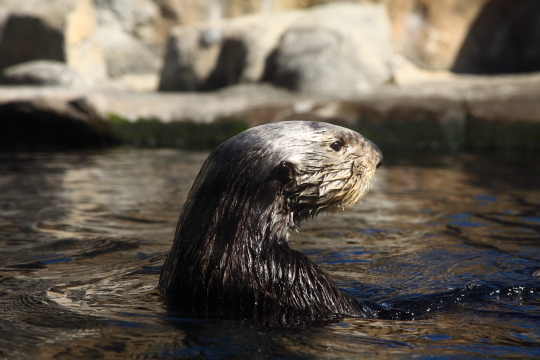 Another one of my favorite things we saw was the sea otters. We didn’t get to see them the last time we went to this aquarium and they are definitely fun to watch. I also liked seeing the Octopus in the Ocean’s Edge section which is a darker area of the aquarium. I want to take a quick moment and talk about about people who photograph the tanks inside the aquarium. There are usually specific places, the octopus tank being one of them, where it says not to use flash photography. I choose to abide by the rule of never using flash on any indoor tank, I don’t appreciate a flash bulb flashing in my face and I assume fish don’t like this either. 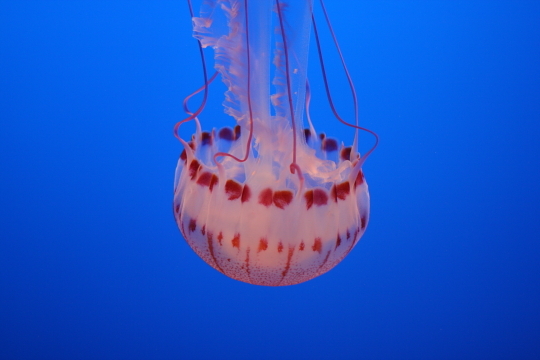 This is why I take advantage of high ISO’s and fast lenses when going to the aquarium. Flash photography at an aquarium doesn’t make that much sense either, if you use your flash to take a picture of a fish in a tank chances are your flash is going to bounce off the tank and cause a huge blown out area in your picture. So please don’t flash the fish. Okay rant over. 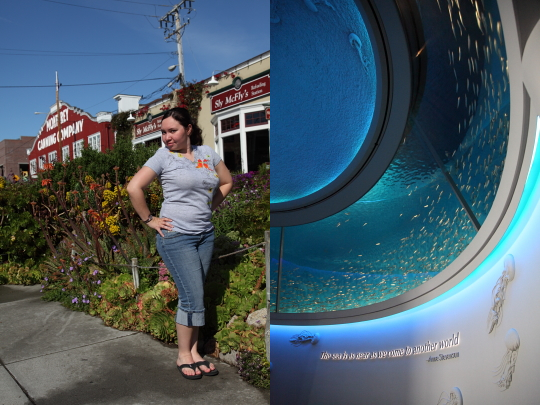 We made it through the aquarium pretty quickly and walked back down Cannery Row where we took a few photos of ourselves overlooking the ocean. You’ll notice off to the left of the picture of us is a restaurant called The Fish Hopper, we decided to eat there before our very long drive home. On our way back to our car Bryan found a candy store where he stocked up on salt water taffy and got some chocolate covered gummy bears. He was like a kid in a….well you know. 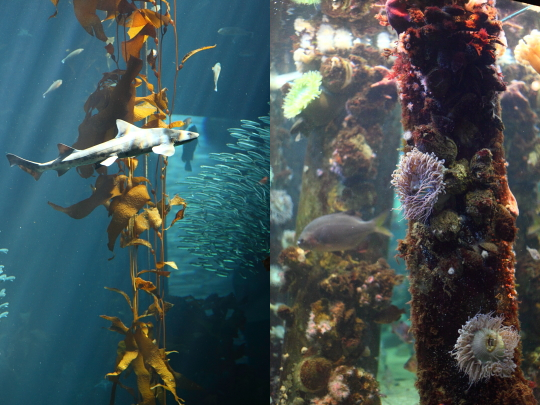 For more of our photos from the Monterey Bay Aquarium check out our GALLERY.